Basena Lule Ssekagya and Kajoba on the tactical bench. FOOTBALL–After Uganda Cranes conceded its first goal of the 2017 World Cup qualifiers campaign aganist Egypt and in the due process, lost their first game and top spot in Group E, interim coach Moses Basena has promised that their is more to come from his players. The Cranes lost 1-0 to the Pharaohs at the Borg El-Arabi stadium in Port Alexandria, thanks to a Muhamed Salah strike in the sixth minute, meaning that qualification is no longer in their (Cranes) hands with two rounds to play. The Cranes will now have to win both their last two games and hope Egypt slips up some where along the way. Basena was quick to acknowledge the efforts of the team. “Yes we lost to a better side but trust me we fought till the very last minute and for that am proud of the boys. Its such a pity that we did not create more in terms of goal scoring opportunities and that we miss behaved on the set piece we got towards the end,” he said. Basena, who has been in charge of the Cranes in four competitive fixtures, was also full of praise for the team captain Dennis Onyango after his man of the match performance. “I am so grateful to have a keeper like him as my last line of defence. We let him down in one way or another because he kept us in the game for so long and we did not reward him at the end,” Basena said. Onyango, the reigning African-based footballer of the year and South African giants Mamelodi Sandowns custodian, collected a ball from the back of his net for the first time this campaign but made as many as four world class saves to deny Egypt although his team mates could not do much to trouble legendary Egyptian goalie Essam El-Hadary on the other side. On whats next after the loss to Egypt, Basena it is more like a league. “We still have two games to play, all I ask is that the players keep fit and we take the battle to Congo and Ghana,” he said. The interim coach, who was only entrusted with the job until after Tuesday’s game in Alexandria, admitted Egypt are now favourites to qualify for Russia 2018 from Group E, but insisted Uganda will not give them [the Egyptians] a smooth ride. Basena and his technical team await on Fufa to make a decision on whether to give them the job permanently or hire a new manager to oversee the Cranes. Uganda’s next game is early this coming month (October) at home to Ghana before they conclude the campaign away to Congo Brazzaville in November. Pic 1. Moses Basena(right) with one of his assistants Ibrahim Ssekagya, discussing tactics. Pic 2. 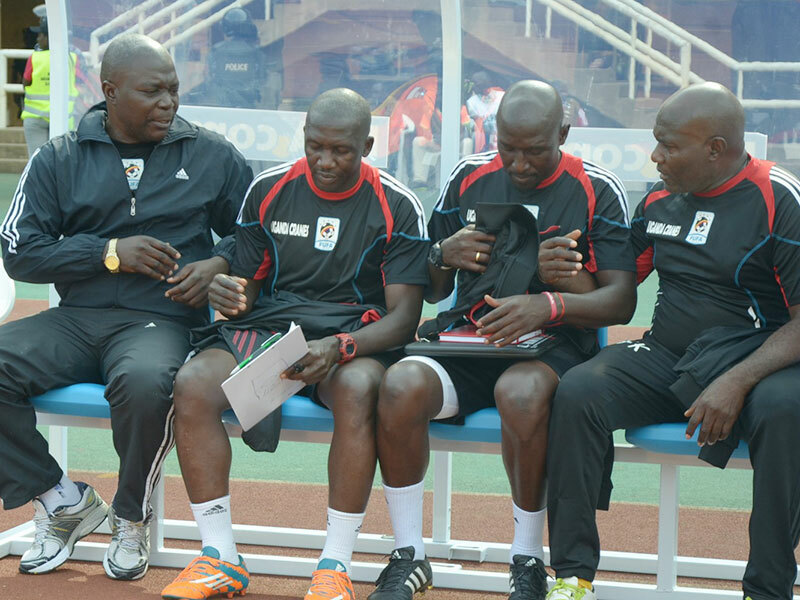 Moses Basena(left) and his tecnical staff during a match at Namboole.